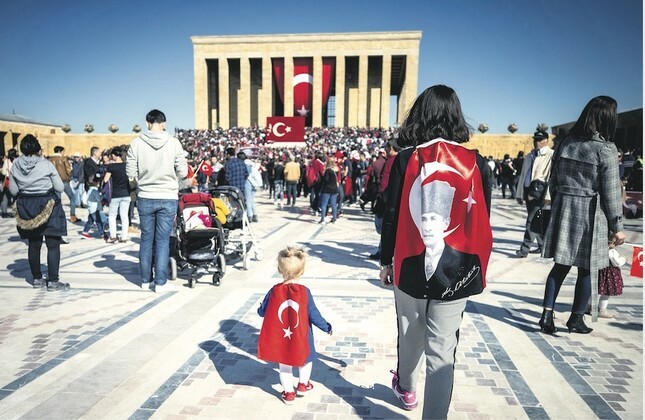 People across Turkey on Saturday mark the 80th anniversary of the death of Mustafa Kemal Atatürk, Turkey's founder, first president and the leader of the Independence War. Atatürk died at 9:05 a.m. on Nov. 10, 1938, with the nation grinding to a standstill for sirens that have sounded at exactly the same time every year since. A high-profile ceremony was held at Anıtkabir, the mausoleum of Atatürk in the heart of the Turkish capital of Ankara. Alongside a delegation including Turkish ministers and senior army officers, President Recep Tayyip Erdoğan visited the mausoleum, placed a wreath, a moment of silence was held and Turkey's national anthem was sung by Erdoğan and the delegation. He also left a written message on the book of commemoration to pay tribute to Atatürk. "Despite malicious attacks at home and abroad, we are walking on the path with a determination to make Republic of Turkey one of the strongest and prosperous countries in the world. Rest in peace," Erdoğan said and added that Turkey's latest pride - Istanbul Airport - was inaugurated in the 95th anniversary of the republic. The €6 billion ($7.2 billion) first stage of the airport, which was built in nearly three years through a public-private partnership model and officially opened on October 29, is one of a series of mega-projects planned for Turkey's 2023 centennial. After the state ceremony on Saturday morning, Anıtkabir has been opened to the public. Hundreds of thousands of people visited the mausoleum to pay their respects as part of a long Nov. 10 tradition. Last year, Anıtkabir was visited some 920,000 people on Nov. 10. Meanwhile, a separate commemoration was held in the Turkish parliament as several lawmakers, including Turkish parliament deputy speaker Levent Gök and parliament staff members, attended the event. Sirens of police vehicles, ambulances, ships and fire trucks wailed while people walking on the streets stopped and observed the one minute of silence. In Istanbul, motorists went out of their cars and observe the silence to honor Atatürk's memory, even on busy highways during rush hour. Flags across the country are flown at half-mast. Following the collapse of the Ottoman Empire after the war, Atatürk led the Turkish War of Independence, which defeated Greece and the European powers that occupied parts of Anatolia. When he became president, Atatürk transformed the former empire into a modern and secular country. In Istanbul, Dolmabahçe, an Ottoman palace where Atatürk spent his last days, was also at the center of the commemoration events. The room where the revered leader passed away opened to visitors, as is the tradition after a remembrance ceremony. Visitors, who formed long lines to see the room, left carnations in the colors of the Turkish flag on Atatürk's bed. President Recep Tayyip Erdoğan, who released a statement Friday for the occasion, commended Atatürk's leadership for uniting the nation during and after the Independence War. He called for children and young people to be taught about his determination and the principles upon which the republic was founded. Erdoğan also said the government was resolute in its efforts to achieve the objectives of Vision 2023, which aim at transforming Turkey into one of the world's top 10 economies.